I served these with my umami beef rib roast for Christmas dinner, and my wife, who considers herself a spuds aficionado and isn’t prone to hyperbole, told me these were the best mashed potatoes she’s ever tasted. I will say the same. But the real Christmas miracle was how these potatoes fared 24 hours later. Unlike other mash we’ve made, these potatoes remained light and fluffy, instead of gummy and clumpy. The second technique was from Joel Robuchon, considered by many as the world’s greatest living chef. 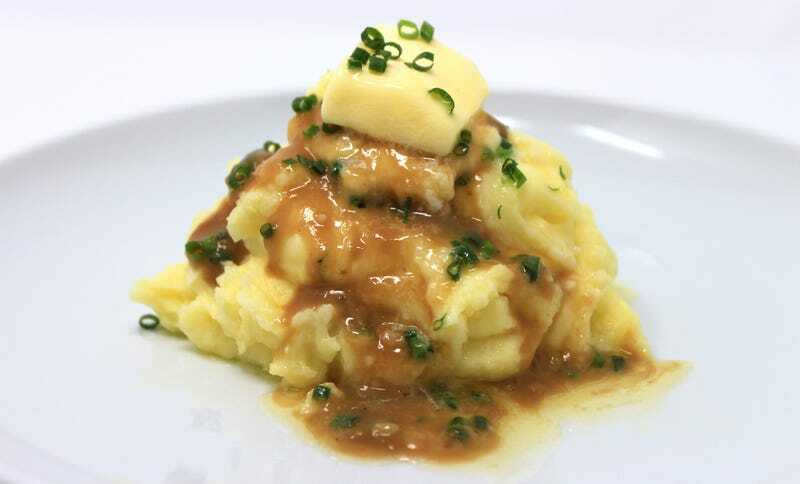 Robuchon became famous on the strength of one dish—his “pommes puree” mashed potatoes, which really should be called potato-flavored cream. His method vigorously whipped chilled cubes of butter (a lot of it) into potatoes before incorporating warmed heavy cream. Robuchon achieved that velvet texture by pressing boiled potatoes through a food mill, which most home cooks don’t own. But one could adequately recreate that silkiness by using a potato ricer, or if you have a lot of time on your hands, pressing it through a fine-mesh sieve. My contribution to this recipe was minimal: Adding fresh chives and a beefy gravy, though these potatoes are so dang good you don’t need either. But if you’re gilding lilies you might as well commit all the way. Upon tasting this, my wife said: “This is the type of mashed potatoes served to rich people.” Behold: Millionaire Mashed Potatoes, for princes and paupers alike. Peel your potatoes and cut them into rounds 1/2-inch thick. In a colander, run cold water and scrub off—as best you can—the starchy surface with your thumbs. Toss these into a pot of cold water, enough to submerge the potatoes with an extra inch of water. Turn the heat to high and bring to a boil. Set a timer for 30 minutes. In the mean time, take 1 1/2 sticks of butter from the fridge and cube them. Place butter into a bowl and back into the fridge. In a separate sauce pot, warm heavy cream over very low heat. Your potatoes will absolutely be cooked after 30 minutes (to be extra sure, pierce with a knife—it should slide in with no resistance). Empty over a sink back into the colander (be careful!). You’ll now press these potatoes through a ricer back into the waterless-but-still-hot pot. Once done, add the chilled cube butter in three batches, whipping the potatoes with a large metal spoon vigorously. Sprinkle in salt and pepper to taste. Slowly pour in the warmed cream, and keep whipping with the spoon. You may choose not to add the full cup of cream, but I like my potatoes ethereally fluffy. Sprinkle on fresh chives, add gravy if you desire (see recipe below), and serve immediately. In a saucepan, add water and beef base and warm over medium heat. Pour stock into a Pyrex cup and set aside as you make the roux. Continuing on medium heat, whisk butter and flour together for 3-4 minutes in the saucepan, until it bubbles and turns a deep blonde. Slowly add the warmed beef stock into the roux, whisking vigorously to ensure no lumps. Keep whisking. If you’d like your gravy a bit thicker, don’t add all the stock. Add a few dashes each of Maggi seasoning and Worcestershire sauce, and a few grinds of black pepper. Whisk some more. For more gravy ideas, watch The Takeout’s video series Good Gravy!